In the country music oasis that Branson has become it was really just a matter of time before an indoor waterpark was erected to cool off the tourists all year long! Missouri's first indoor waterpark has a three-level treehouse as its centerpiece with interactive water play features on each level. The treehouse is topped with a 1,000 gallon tipping bucket which dumps water on its giddy patrons every eight minutes. The park also features a basketball play area, a toddler pool with jumping water, bungee swings, a frog slide, an Ozark Trout slide, and rocking toads. A 250 foot lazy river meanders through the natural landscape of an Ozark river bank. The river bank features multiple seasons, possible because of large windows that bring natural outdoor surroundings of woods and a dry creek bed, all enveloped by surrounding growth commonly found along Ozarks creeks. 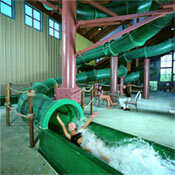 There is also an outdoor waterpark that is open seasonally.